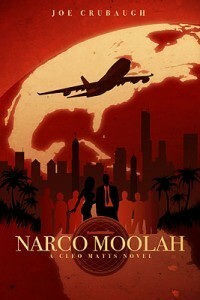 Narco Moolah is the second book featuring Cleo Matts but, by Crubaugh's admission, this is the book he recommends that people read first. Being used to political thrillers which dealt primarily along the lines of nations having differing opinions and beliefs, I've never read a story like this particular political thriller. Even so, I was glued until the end. I enjoyed the lighter reading material interspersed throughout the story. There were times I erupted in laughter at the silly phrases I read and when trying to imagine the various scenarios unfolding. Other times, I marveled at the descriptive phrases Crubaugh used as if they were pieces of art. His characters were well crafted - both the good and the bad - and I was eager to learn how everything would unfold. In a world (existing inside my head and, perhaps, yours) it seems profound that world leaders would deliberately seek to destroy people with addictions instead of trying to help them. It seems unreal that they would intentionally seek to make the poorest among us even poorer. Yet, in Narco Moolah, I was introduced to a political power intent on doing just that, so it could boast being in the possession of billions of dollars. It was definitely exciting to read as the stage was set and it rushed toward the finish line. There were twists and turns and sometimes my jaw dropped as I (falsely) suspected a series of events to unfold. All in all, it was a terrific read which I would highly recommend. Click on the book cover if you would like to visit its page on Amazon.